Please refer to our stock # B-9 when inquiring. "Kosode: 16th-19th Century Textiles from the Nomura Collection" by Amanda Mayer Stinchecum, with essays by Monica Bethe and Margot Paul, edited by Naomi Noble Richard and Margot Paul. 1984 First Edition, Japan Society and Kodansha. Clothbound Harcover with original dust jacket. Condition - new. 234 pages. "Rare and early kosode of the 16th and 17th centuries, known to have adorned some of the most resplendent personages of that age, lend particular distinction to this collection. The textiles are presently housed in the National Museum of Japanese History (Kokuritsu Rekishi Minzoku Hakubutsukan) in Sakura, Japan. 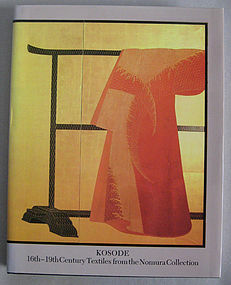 This book, published by Japan Society and Kodansha International on the occasion of an exhibition of the Nomura Collection at the Society's Japan House Gallery in New York City, pesents in rich detail the technical and aesthetic evolution of kosode (small-sleeved robe.)"